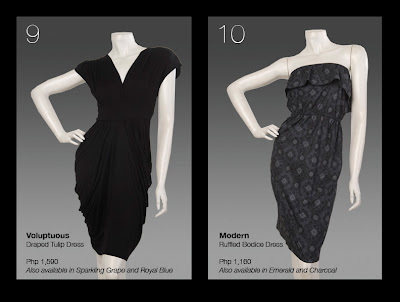 Go dramatic with an asymmetric draped dress. Wear it with a chunky gold cuff and sky high heels. Or you can choose to be do a Dita Von Teese with a printed body skimming halter dress and red lips. Get all sweet and saccharine in a satin dress with ruffled sleeves and a rosette belt. Or go the classic route with a bustier dress. Casual days can be dress up days with these LBDs. The cotton dress on the left is kinda Margielic, while the tiered chiffon dress on the right is so boho chic with fringed Minnetonkas! This flared sleeve tunic is all about drama while the blouson blocked dress looks like it's meant for skinny chicks who can get away with anything. Curvy chicks, stay away, unless you are looking for trouble, haha! 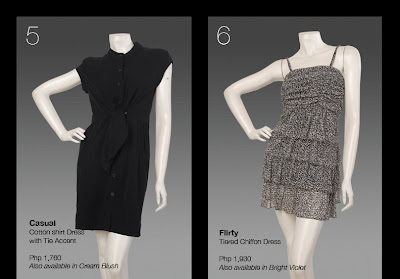 Oh, and if you are not into black, these dresses come in different colors too! 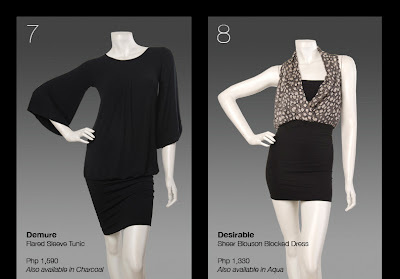 This makes me want to go home to the Philippines just to shop till I drop!